You can use Scrapbook in Office 2008 for Mac to move text and images around. You use the Scrapbook to collect and store multiple text items or images as clips, which you can use at any time in any Office document. The Scrapbook is particularly useful when you have “boilerplate” text or an image, such as a logo, that you use frequently in new documents. In contrast to the Clipboard, which holds only the last item you cut or copy, the Scrapbook holds your clips until you remove them, even if you quit Word (or other Office applications). To see your Scrapbook, choose View→Scrapbook. In the Toolbox that opens, select the Scrapbook pane. 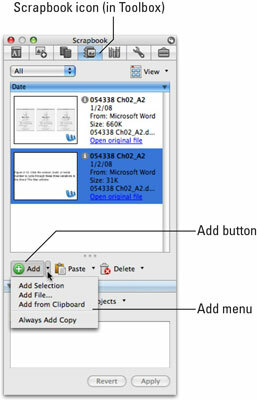 To insert text or graphics from a document into the Scrapbook, first select the text or graphic in the document and then either drag it onto the Scrapbook and drop it or click the Add button and choose Add Selection from the drop-down menu that appears. To insert text or graphics you’ve already copied or cut, choose Add→Add from Clipboard. Drag the image onto the document and drop it where you want it to appear. Move the cursor to the place you want the text or graphic from the Scrapbook to appear and then click the Paste button. To automatically add every item you copy in any Office application to the Scrapbook, choose Add→Always Add Copy. To remove an item from the Scrapbook, select the item and then click the Delete button. The Always Add Copy feature can lead to slow performance and low hard drive space if you allow the Scrapbook to fill up with hundreds or thousands of clips. If you still want to use this feature, just remember to clean out your Scrapbook frequently by selecting and deleting any and all clips you don’t need anymore.